August. It is going to be August in 23 minutes. All around Facebook, moms look like they’re readying to turn the page into fall and school and rhythm and routine. Maybe it’s because school in Wisconsin doesn’t typically start until September, but I feel like summer has hardly begun! We’ve only been to the beach once, we’re still trying to get into a good routine of playing outside more (inside-loving mama here…), and I’m still waiting for strawberry season to begin. Wait…yeah, I totally missed that one. Planned to go picking at the beginning of July only to find out the season ended in June. Whoops! I guess more jam will have to wait for autumn raspberries. We are turning the page in a pretty big way, though, and the dawn of August makes it only too real. After six years of Gabe being in public school, we’ve decided (I think…I’m pretty sure…gulp) to homeschool him in the fall. The little people, too, although that’ll be a whole different and much simpler ballgame. I always said I would never do this. In fact, it’s more accurate to say I declared I’d never do this. I didn’t know a lot of homeschooling families in my youth, but the ones I did know…were…different. They donned dresses with high necklines and long hemlines. Homemade, of course. They didn’t watch tv. Movies and dances were out of the question. They feared God’s wrath if they sinned by skipping Sunday night church. Actually, they seemed to fear God’s wrath for most anything. I was never going to be that family. Then, I grew up and became a public school teacher and was equally convinced I’d never homeschool my children. Children need the structure! They need the social contact! They need the variety! They need the convention! 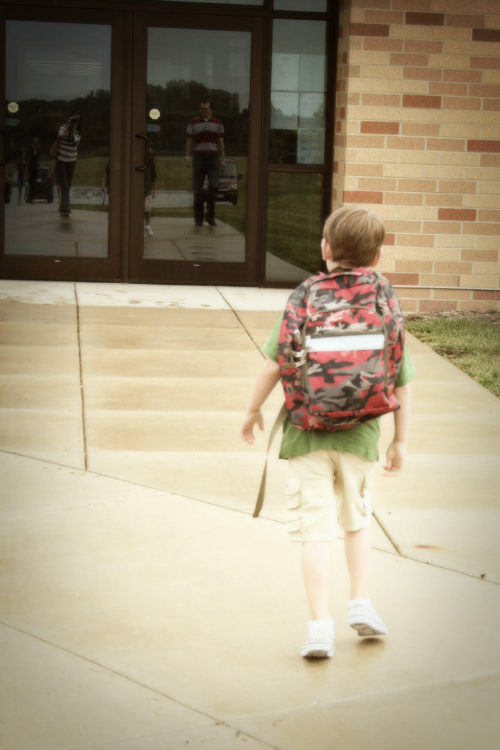 In spite of the disillusionment I developed about public schools during my time as a teacher, I harbored no questions that my children would be attend school–private if we could afford it and public if we couldn’t. And we couldn’t, so public it was. Then, we had Gabe. And as I’d planned, we sent him to school. And it just…didn’t…work. He’s had some truly wonderful teachers, and I am absolutely certain that God opened the door for him to attend the school he’s been attending. But around December of his 5th grade year, we knew. We’d taken this school as far as we could expect to take it. We churned over the options for some time. Sending him back to this sweet K-8 country school was still on the table, with the caveat that we could only do so acknowledging the fact that we’d have to accept less than what best suited Gabe’s individual learning style. We looked for other public options, and we briefly entertained some private and virtual options. None seemed quite right. 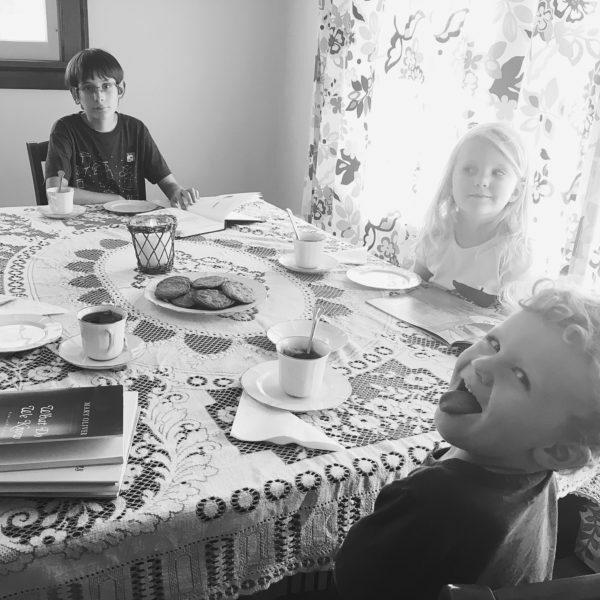 Since he started kindergarten, I’d started noticing bloggers who homeschooled, bloggers who were like me in their passions and interests and convictions, who also homeschooled. They valued education, valued social interactions and constructs, weren’t traditional religious conservatives, were creative, and loved the idea of hacking their children’s educations. It finally began to dawn on me that there was more than one way to homeschool. As I read those blogs, I repeatedly found myself thinking, Yes! This is what I want for my children! I want to immerse them in a love of learning! In excellent literature! In rich art! In first-hand exposures through travel! With solid, thorough preparations for the integral life skills school never has time to teach! If they can do it, why can’t we? Gabe’s a unique learner. He’s academically very quick at some things but doesn’t pick up the softer skills via attrition. Public school, however, works exactly the opposite. They spend the bulk of their time on the academics while students develop those softer skills mostly on their own. Further, Gabe was thriving less and less under the pacing available to him at his school. We’d spent his first five years attempting to advocate for him in order to avoid the very thing against which much research cautions–disengagement in gifted tween boys. And yet in 5th grade, his disengagement at school became alarming to us. 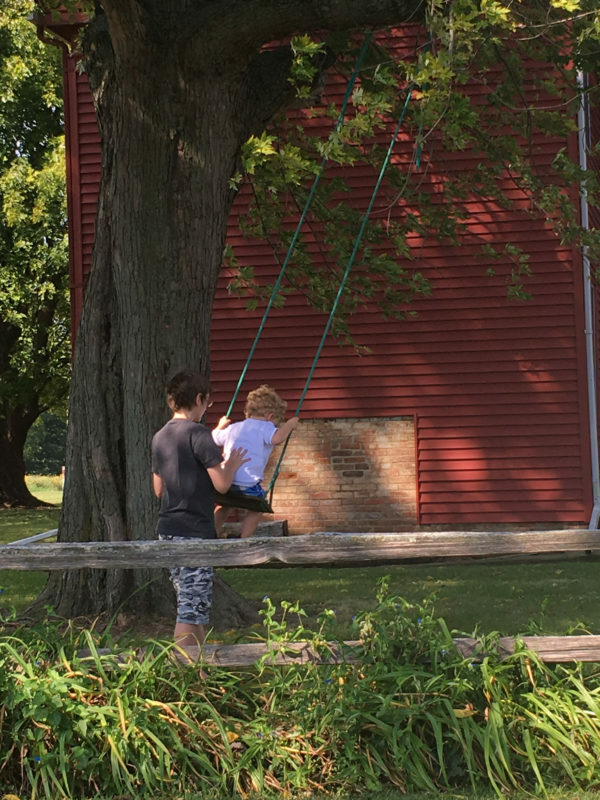 We’ve sighed lots of discouraged sighs–and, quite truthfully ached over many uncertain fears–around here as we tried to find ways to stick with convention, get through, and make it work. 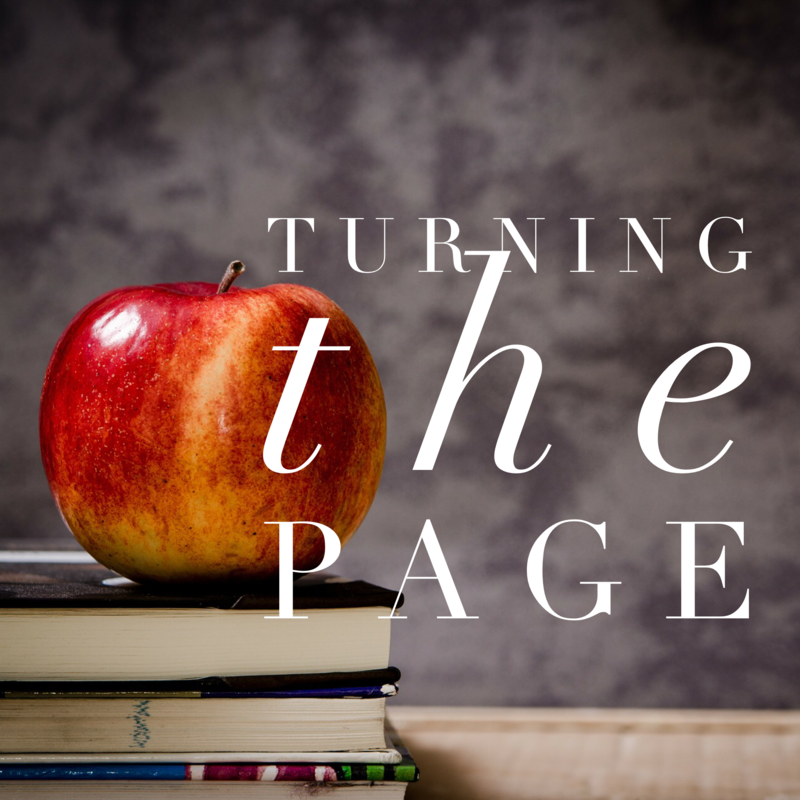 So as we start turning the page toward fall, we’re turning the page in a big way for our family and beginning to homeschool. I’ll elaborate more on our decision and plans later. I think I’m finally getting things narrowed down and developing a picture of what the next few months might look like. 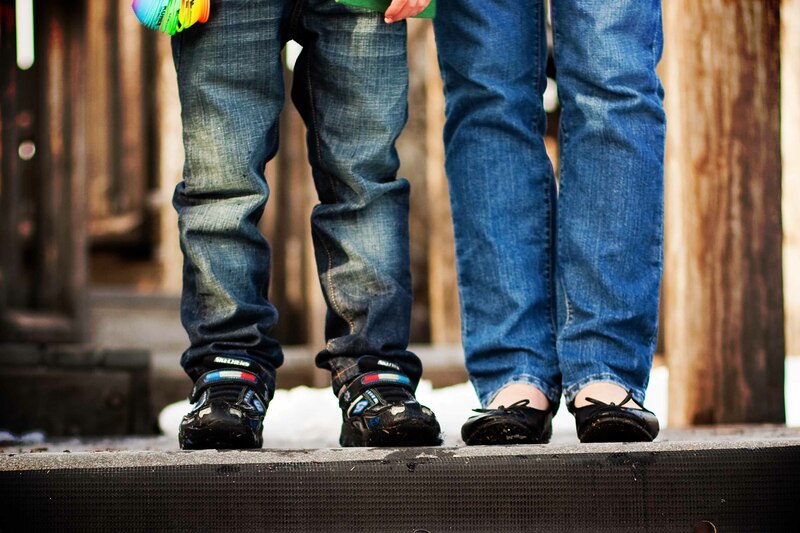 But for now, I’d love to know…have you ever turned the page in a big way (school or otherwise) for your family? How did you prepare everyone for the transition? And if you’ve specifically turned the page from being a public school family to a homeschool family, what wisdom do you have to offer? It was just one of those days with screaming and hitting and managing every little thing. And that was just me! HA! Not really, but it wasn’t my most stellar day. While the kids climbed the walls (and screamed and hit and bickered and irritated one another), I felt like pulling out all my hairs one by one would be a pleasant idea. My own skin constricted me and I clamored to break free of all the anxiety. Oh dear God, make it stop! This was also my mind’s constant refrain during our last few weeks of school, the weeks during which my anxious 5th grade tweenager sassed and tormented his sister incessantly and refused to get out of bed and did all the typically bothersome things tweenagers do. How am I ever going to get through this summer??? I’m an anxious person by nature. I feel safer surrounded by all things slower and methodical. 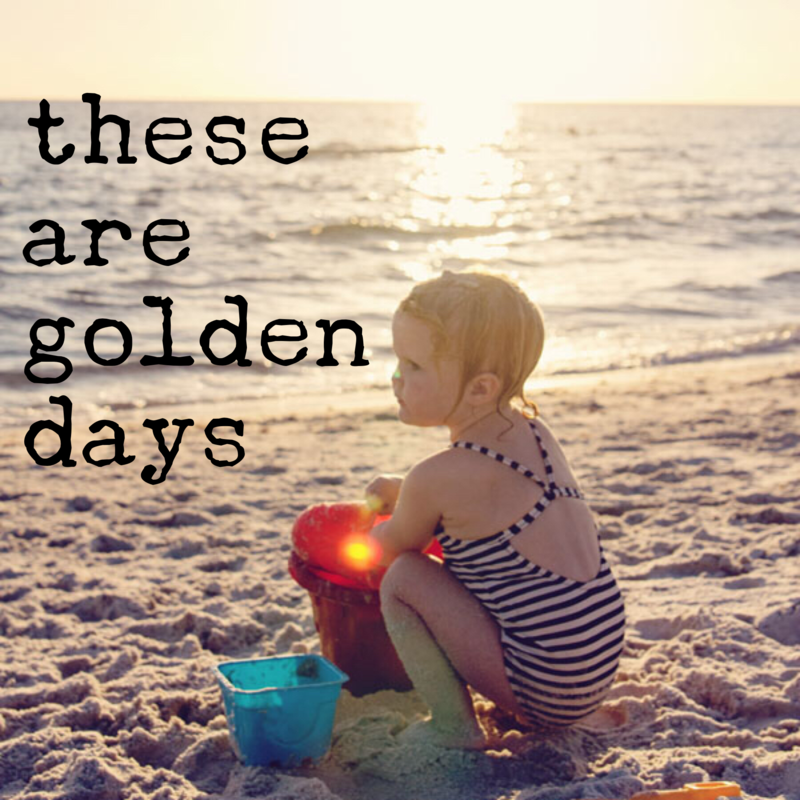 Preschoolers don’t lend themselves well to this lifestyle, but I’ve found ways to carve a path that is mostly accepting of their chaos and my own drive for calm…namely daily naps for the three of us and a good dose of reading, especially when it involves me reading grown-up books to myself. 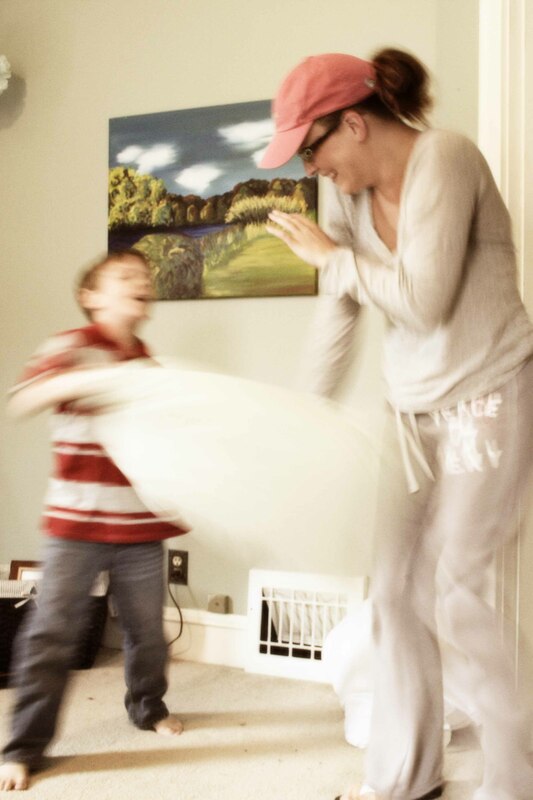 The idea of adding a volatile preteen to our every moment…well, that thought terrified me. 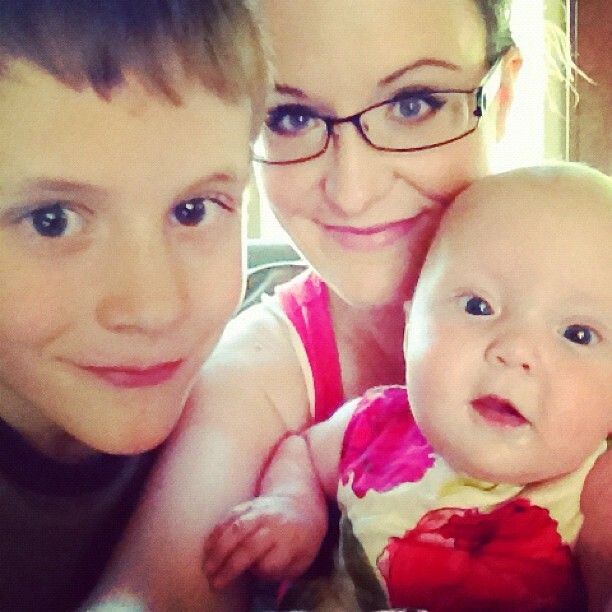 I love my kids, for sure. They’re (mostly) fun to have around. But I know I’m not alone in the experience of worrying about getting through summer vacation with my sanity at least somewhat intact. The end of our school year was particularly chaotic (hello there, vomiting/traveling husband/principal’s office/etc. ), and I knew that given my own struggle with anxiety, I needed a game plan to get me through, a path to protect my soul from the impending onslaught of busyness, bickering, and boredom that was about to define my daily existence. We’re a month in now…are you making it? I’m in a Facebook group in which a fellow mom recently asked how many of us were over summer break, and the answers reminded me that I’m not alone feeling like the next month or two is stretching into interminable chaos. I thought I’d share the few things I’ve been trying to implement in order to keep my anxiety in check. Hopefully one or two of these ideas will help you feel like you can survive, thrive, and enjoy your kids during these next few months. It took me all the way through Gabe’s early years and well into Isla’s before I finally decided it was okay to admit to myself that I have needs. I need physical activity. I need time by myself. I need quiet. I neeeeeeeeed sleep. Somehow, I’d convinced myself that the fact that I’m a mom means I can’t have needs anymore. The needs? They’re still there. They never went away. The fact that I’m a mom does mean I can’t always meet my needs the way I might want to, but the answer isn’t in denying the needs exist. Pretending always produces anxiety. I’m much less anxious if I at least acknowledge them and either meet them or make the decision to shelve them a conscious one. Who doesn’t need a good game of dress-up? If I find a particular child to be getting overly yangy, I think back on how recently we’ve connected one-on-one. Often, it has been a while. That’s a good clue to me that we need to slow things down and find ways to connect individually with each child. It staves off so many problems, and a small investment of my time goes a long way to keeping the peace around here, something I desperately covet for my home environment. Having a crappy morning? Hole up with a few good books! This was my most favorite way to get through tough days when it was just me and Gabe. I don’t do it as much with the littles, but I should probably be doing it more, not less. We recently started a family read-aloud chapter book (Danny, Champion of the World). I wasn’t sure how it would go given our wide age spread and varying attention spans. However, it is almost always a hit. Gabe likes it and the littles sit still through it. Actually, the same is true even with picture books. If I start a few with the littles, I often find Gabe meandering in to join us. A few other titles I’d like to get to soon…Mary Poppins, The BFG, and Half Magic. Maybe some Charlotte’s Web and Little House on the Prairie, too. And Ramona, for sure! Along similar lines, when I’m super anxious, I tend to “hide,” disconnecting from the outside world and getting lost in my head. I’ve been trying to adjust my hiding a bit so I do it with a book. I want my kids to see reading modeled, and I want them to know it’s something I value, even as an adult. I figure it’s a good way to use a stinky situation (my anxiety) to model a desired behavior, at least some of the time. About two years ago, I realized I needed a few hours alone once a week, and Tahd and I arranged that I’d get out of the house solo on Wednesday nights. I quickly realized I was like a very arid sponge, and the alone-time was like a gentle mist of water I sucked up as fast as I could get it. We had a good thing going through the school year, but when summer hit and our schedules changed, I stopped going. That summer was terrible! I felt like I was constantly on the brink of crazy and was operating from zero. 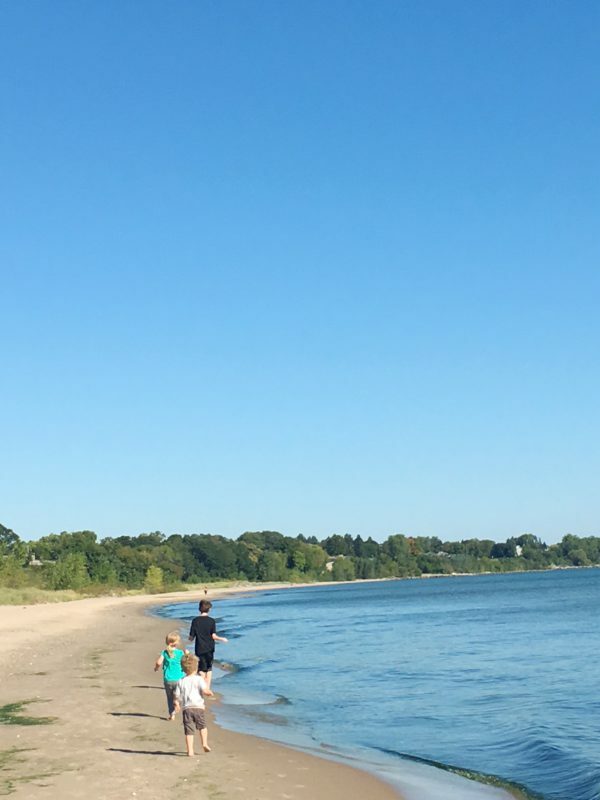 When school started in the fall and I resumed my Wednesday evening solo excursions, my head felt much clearer again, and I resolved that I wouldn’t make the same mistake the next summer. I haven’t, and it helps so much! Just a few hours away and I come back feeling like an actual human being again–not exclusively a mom. That investment of those hours alone are good for my soul, and they also help me be a better wife and mom through the rest of the week. It’s totally worth it, in my opinion. I’m not super extroverted, but I can see that someone who is might especially benefit from doing this with a friend or even a group of girlfriends. If that’s more up your alley, do that. I think the key is to just do something! I’m not an outdoorsy person, but I can’t deny the power of getting outside to change the mood of the day. Often, I have to force the issue, telling them it’s not an option so much as an order. Or, rather, telling myself it’s not an option so much as an order. Gabe would rather loll on the couch and Isla gets irrationally overwhelmed by breezes and bugs, but a forced 20 minutes of outdoor time often expands into an hour or more of outdoor play, and by the time we’re done, everyone’s happy again. To a lesser degree, the same thing is true even if we change the scenery in smaller ways. Maybe we get out of the house to the library or even a store. Or maybe we’ve been hanging around downstairs for a while so we all trek upstairs to fold laundry or make beds or something inane like that. Whatever it is, the change in scenery seems to help us reset when we’re entrenched in our crankypants moods. 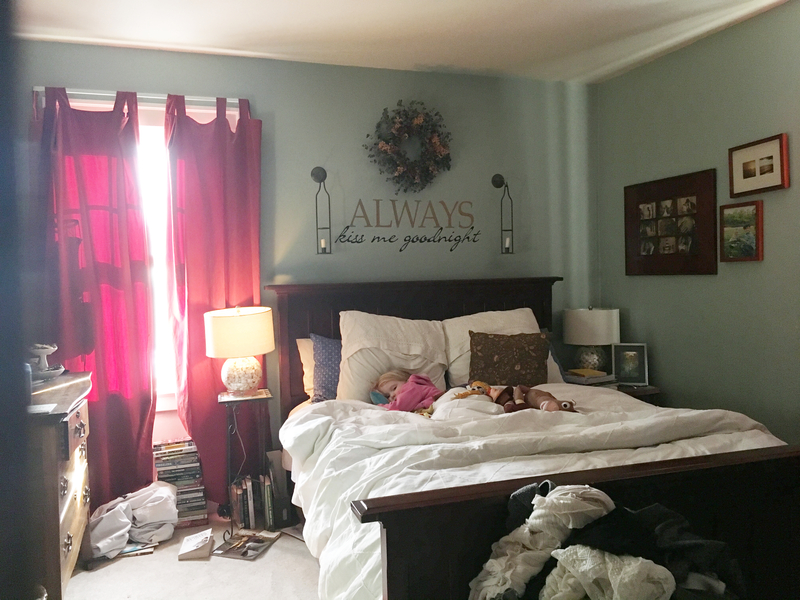 Or whatever “your thing” is…For me, days with unmade beds feel lazy and haphazard. If I go upstairs and see bedrooms full of chaos, I just want to crawl back in and pull the covers over my head! Having the beds made somehow helps me stay motivated and focus. See? Laundry and general room chaos? No bueno. But the bed is made, even though a child is sleeping. Boom. For you, maybe it’s not beds. Truthfully, that’s not my only trigger button. (Can anyone else hear Tahd laughing???) Another trigger for me is not putting on makeup/getting dressed/fixing my hair. I always think I’ll get so much accomplished on days when we stay lazy in our PJs, but that never works out. On those days, I’m constantly fighting a magnetic urge to sit on the couch or lounge on the bed. Go figure! Maybe your trigger button is making time to take a shower or having your counters cleared or drinking one cup of coffee in silence or going for a run or texting a friend or…I don’t know…a primal scream? We all have our things. I won’t judge. 😉 Figure out what yours is and move it to the top of the list to make sure it gets done early every day. The right now – sunshine, warm temperatures and blue skies, time to drink coffee in savored sips rather than quick gulps, blowing bubbles, dirty feet, pushing babies on swings, sand squishing between my toes, line-dried laundry, lazy mornings with nowhere to go, vacation, peony blooms, juicy tomatoes…when I’m anxious, I miss these things. Quieting my mind to take inventory of my immediate surroundings always produces slivers of welcome joy. I need introspective soul work to be well, but I’ve fallen into the trap of thinking there’s just no time and that it’s a luxury that can be eliminated. Nothing sparks anxiety like not taking care of yourself and lying to yourself about what you really need! 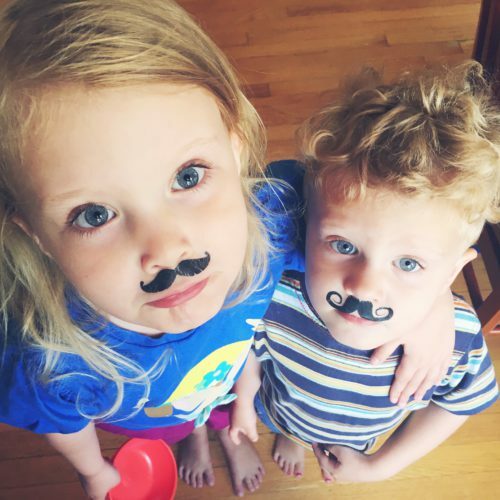 I realized, though, that my kids are no longer babies. They might still be little, but even little people can learn the value of a few minutes of soul care. “Mom is going to take a few minutes to write in her journal,” I’ve started telling them. And then I get them their own writing utensils and sheets of paper. Or when they start in on a craft project, I pull out one of my own–currently a wood slice wreath I started out of the trunk of our old Christmas trees. It’s been a novel realization to me that we can all take care of our creative souls together. Sure, I don’t have hours to get lost in drafting an essay or my own painting project, but soul care is not an all-or-nothing endeavor. Bits and pieces are better than nothing. How about you? Is summer an anxious time for you? How do you keep your anxiety at bay and enjoy this season? It’s my fourth decade of life, and at 38, I guess it’s only fair to say I’m actually closing in on my fifth decade, a fact which seems remarkably grown up even though I have little clue what I’m doing here. Every decade has held its own upheaval, but my 30s? Well, they’ve been a monster. 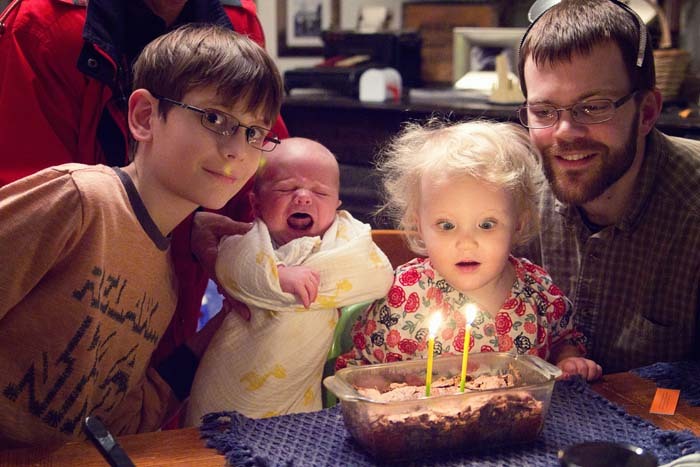 I kicked off my 30s as an anxious, infertile mother of one. 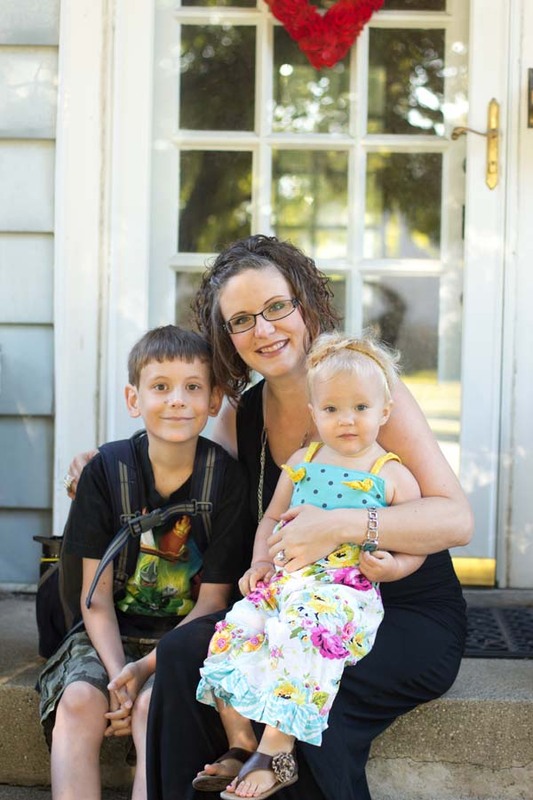 A few years and many, many thousands of dollars later, I was still an infertile mother of 1, but with a history of many failed fertility treatments–even a failed IVF–and the debt to show for it. 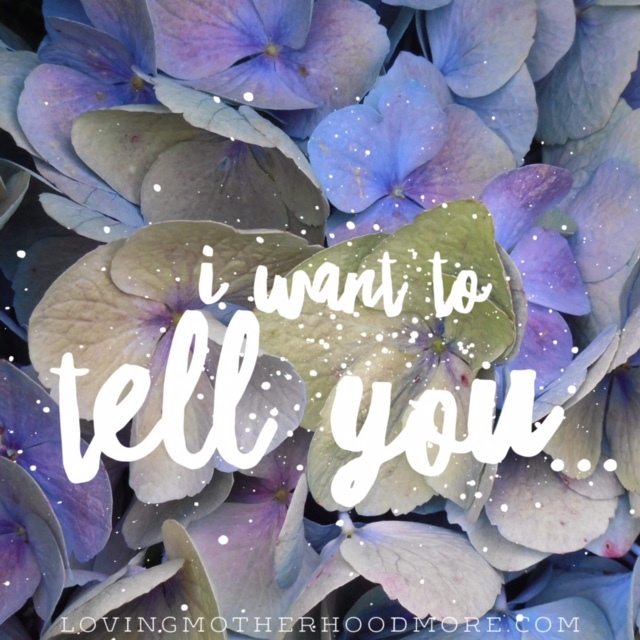 Miscarriage defined my next phase, the loss of our sweet baby girl at the beginning of my second trimester completely ravaging my little family. Then deep, deep anxiety when I once again found myself pregnant with a little girl, full of hopes she would make it into the world and into our lives. She did, and her first year is one of my sweetest on record, full of joy and disbelief at my wonderful luck. Then, unexpectedly, came a crash when we were once again pregnant, this time a more difficult pregnancy that was laced with even more anxiety than the last. 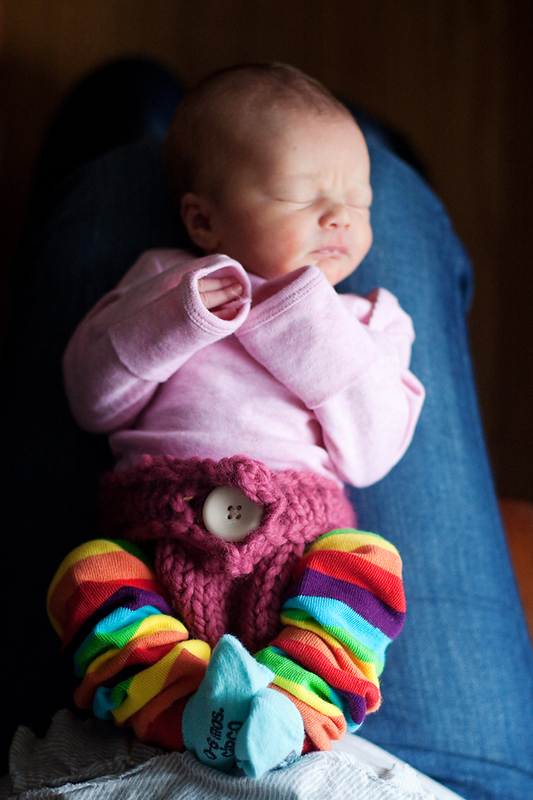 Finally, a whirlwind end to pregnancy via emergency c-section followed by eighteen months of Colic and Chaos. That’s a real thing, you know. It’s not “colic.” It’s Colic and Chaos. Official and italicized. Maybe with a few expletives thrown in for good measure. Colic was much more than the sterile online descriptions gave it credit for, and it lasted much longer, too. Jude was colicky for 18 months. That is a very long time to listen to a child cry! 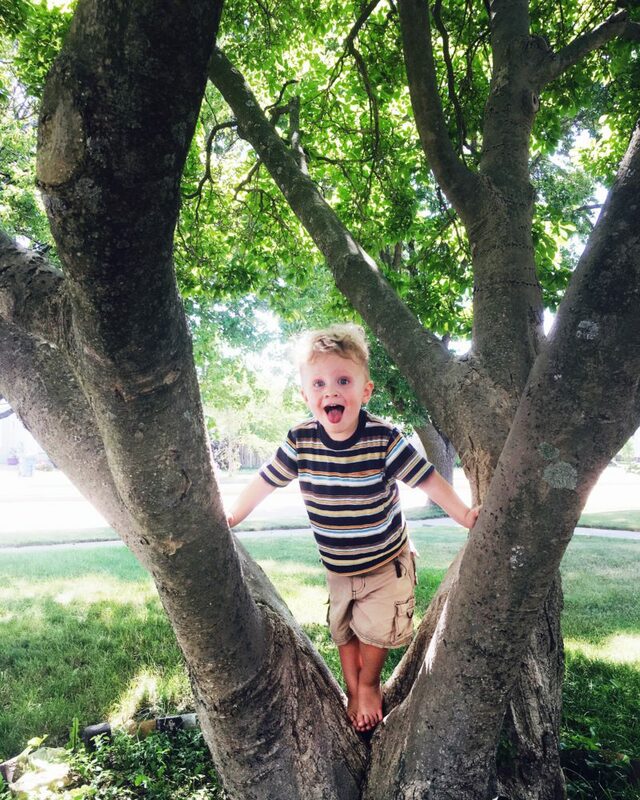 If I thought I’d only barely survived during our infertility and miscarriage, debacle, Jude’s colic showed me that I could, in fact, feel even crazier and more depleted than before, a fact which surprised me anew every day. Around 18 months, the fog started to lift. I thought it was too good to be true at first and was scared to think it was finally happening, but it’s been a year since that point and I can finally see the forest for the trees. This unexpectedly crazy, overwhelming, painfully exhausting life? It’s getting easier! Little by little, day by day, bedtime by bedtime, joy after joy…it’s happening. I’ve spent the last year caught in a strange place, though. I should feel happy, relieved, energetic. I should be excited to have exactly what I’ve always wanted and prayed for and worked toward. This ground should feel like a firm launching ground, an opportunity for dreams to be built. But it hasn’t felt that way at all, which confused me. I’ve spent much of that last year wondering what on earth is my problem. The truth is that I lost myself when I miscarried Mara. I fell apart, nearly disintegrated, really. I had to put the pieces back together again–not like they were before, but in a new way that fit my new reality. For as terrible as it was to go through that experience, tragedy wipes slates clean, and that tragedy enabled me to rebuild from scratch. All options were open to me (Good Wife reference, anyone?). This has some advantages. Don’t get me wrong–I’d still far rather have her than the clean slate, but if I can’t have her, I’m grateful for the clean slate. I didn’t, however, expect to fall apart again after my third baby. His chaos and my falling apart caught me completely off guard. Falling apart unexpectedly like this is different from falling apart after catastrophe like Mara. It’s muddier and more mysterious. At least it has been for me. You keep imagining the light at the end of the tunnel that never seems to materialize. So here I am again, finally through the tunnel and back into the light, but in pieces (albeit not as catastrophic ones), and I don’t know how the pieces fit. What do I love? What is important to me? What do I believe? What do I find fun? How do I like to spend my time? How does my mind work? I can hardly remember any of these things. I’m finding myself asking myself this every day. Am I who I was or have I become something new? Where have I gone? What do I really want? Do I have any clue how to get there? As I’m reaching this point of transition, I wonder, Is my task more about rediscovering or reinventing? I don’t know which I’m supposed to be doing. Neither feels quite right. So I spin my wheels a bit and eat smores roasted over gas stoves late at night and try to puzzle over who I am and where I’m going and other mysteries of life like how I have an entire bin of mateless socks. That’s probably a whole other post for a different day. I only know I don’t want to be in identity limbo for much longer. It’s unsettling and unproductive, and I want to find my way out of the maze. So, first things first…a nap. That’s always a good place to start, right? I want to tell you how brave you are. I want to tell you that you’re on the right path. I want to tell you that you have what it takes. I want to tell you that you really will miss this, but it’s okay to be frustrated/bored/overwhelmed anyway. I want to tell you that you’ll definitely sleep again. I want to tell you that at some point, it will get easier. I want to tell you that you’ll laugh about it later. I want to tell you how much you matter. I want to tell you they won’t go to college in diapers/sucking pacifiers/eating only chicken nuggets/etc. I want to tell you that you don’t have to keep waiting for the other shoe to drop. I hope you’re well right now. I hope you’re happy. And I hope you know you’re not alone! I sit there, head resting on my hands. Dirty plates and bits of food cover my horizon while children run and scream and laugh and taunt (and scream again). 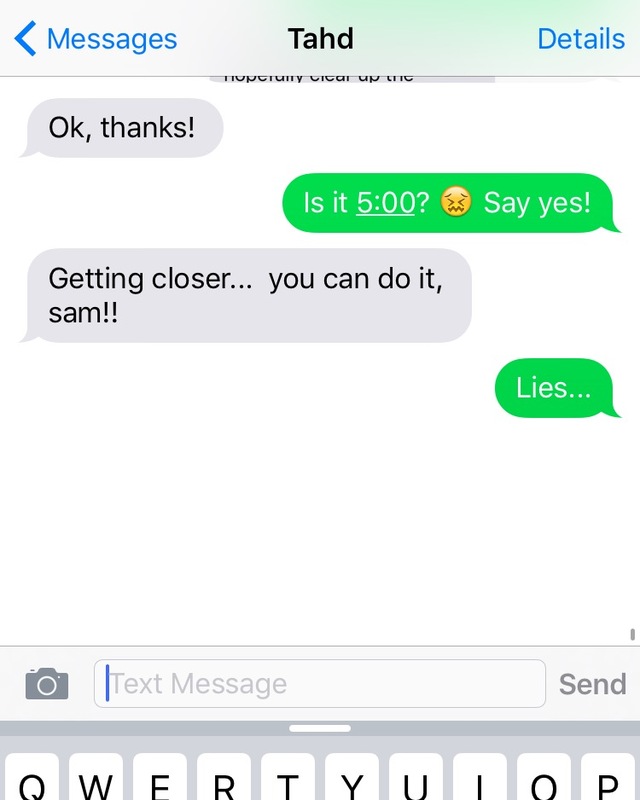 Dad steps in. Music flutters through the background and I close my eyes and wonder. Years from now, what will I remember about this night? Will I remember the sound of a full, happy house? Will I remember squeaky baby voices and belly laughs? Will I remember what it’s like to have everyone at the dinner table, an assurance I can count on every night? Will I remember dinner music? Will I remember the way my children lapped up the macaroni and cheese to which I accidentally added a tablespoon of chocolate milk? Secret sauce, perhaps? Will I remember the way they invite me into their worlds when they ask me to play? For an instant, time suspends amidst twinkling goodness and I’m aware of the raw beauty of the actual moment. This is so perfect, so quintessential, so longed-for. But I worry that it’s not the goodness I’ll remember. I worry it’s the pain: the shame of feeling like I’m not getting it right; the anxiety of feeling like I didn’t do enough; the worry that I’ll feel regret; the uncertainty of not knowing if I’m on the right track; the hopelessness of feeling like I’ve lost myself amidst the drudgery of the everyday. Because sitting there with my head in my hands, that’s exactly what I’m feeling: despair which chokes and frightens and haunts. I want to remember the lovely, but I feel so lost sometimes, like I’ve drifted so far from myself that it would be easier to create an identity entirely new rather than find my way back to the one God gave me. Life exists in seasons. “There is a time for everything,” Solomon once wrote, “and a season for every activity under the heavens.” Seasons to change diapers, breast-feed, toilet train, spoon-feed. But what if meaning is more than that? 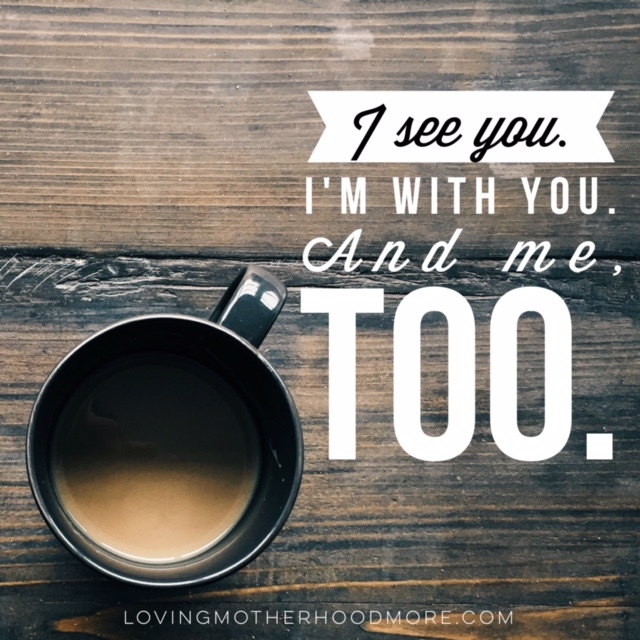 Of course I’m called to be a mother…But if I’m not careful, I lose my identity. I become defined by something outside myself. I cease to be Rebekah, the uniquely talented woman made in God’s image. I’m now only Rebekah, wife of Gabe. Or Rebekah, mother of Cade, Pierce, and Kennedy. I love these roles, but I also recognize that deriving one’s identity from another person is a short road to resentment. I’m not suggesting that we give up on our families and go make our dreams come true. Quite the opposite. Women must discover their callings precisely because the health of their families, relatioships, and communities is so vital. When we become who we’re meant to be, everyone around us benefits. When we live out the stories God wants to tell through us, we bring healing to all who struggle alongside us. That was balm for a weary, discouraged mama-soul. That if I don’t find screaming, breaking up arguments, washing the clothes, and reading board books completely fulfilling, it’s probably because I wasn’t designed to be completely fulfilled by those things. They are treasures in their own way (well, not the screaming…I haven’t come to terms with that one yet), but they are not the only treasure with which my life has been blessed. Maybe, just maybe, it’s not so much that something is wrong with me as I might possibly be normal. That thought comforts me as I stare out over a houseful of messy surfaces and contemplate leaving them as they are to go to bed. And that’s exactly what I’m going to do–leave the mess, leave the worry, leave the shame, and go to bed. Rest for the body and soul. That’s what I need now. It was a picture that sent me on the chase, a deep dive down eleven years of blog archives of my personal blog to see if I could find the one shot out of hundreds I thought I remembered. For the record, I never found it. But what I found instead were memories, stories and photos of things forgotten; some hard, some strange, and many heart-warming–details I hadn’t wanted to forget, recollections I knew would make me smile years later. And they did make me smile. So much! I also found myself there, or at least the girl I was then, in bits and pieces, in those stories. I’ve lost that girl over the past few years, and I’ve been lamenting to Tahd lately that I hardly know who I am beyond diaper-changer, dinner-maker, and house-picker-upper. We could also add laundry-doer to that list, except laundry-doing isn’t so much my forte, which is clearly evidenced by the fact that my little children haven’t had matching or fitting socks in several weeks because they’re all buried in the Mount Everest-sized pile of clean (and dirty) laundry in my basement. The only consolation is that spring is coming. Right? Even to Wisconsin? So just hold on, Chicklets! 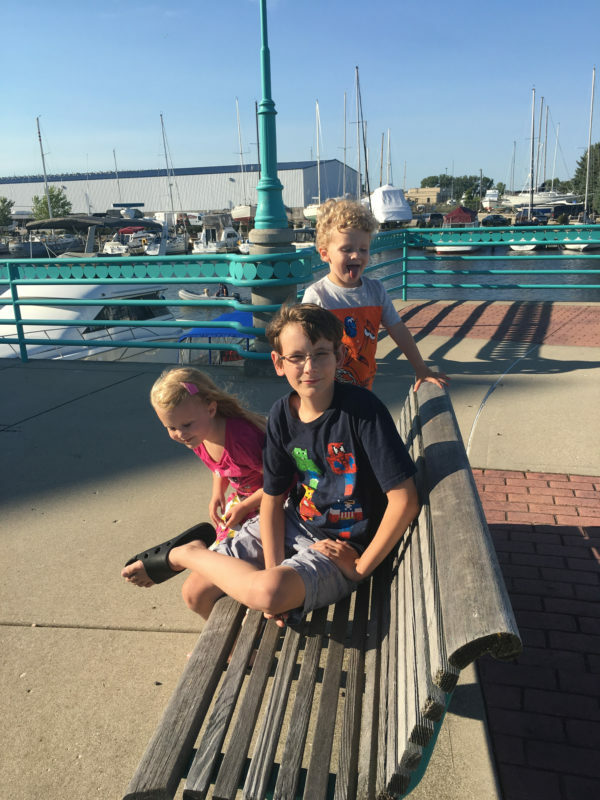 (Yes, I have affectionately nicknamed my children after gum…) If you can make socklessness work for juuuuussttt a few more weeks (or maybe two months on the outside since this is Wisconsin), you should be set! Barefoot, but set! I was saying how my functional identity is basically that of a Mother/Sherpa, the doer of All The Things who doesn’t even end up having time to get All The Things completed for my family for one day before it’s time to start All The Things for the next day. There’s been a new stirring in me this last month, though, almost like a boundary I’m starting to set. I love my family and will sacrifice upon sacrifice for them when needed. But I realized I’m getting it all wrong. I’m sacrificing my very core for their convenience, not their needs. I’m doing, doing, doing for them what they need to be learning to do for themselves and one another. I’m depriving them of the model of a mother who knows her own value and demonstrates that by caring for her own soul and body. How will my children learn to take proper care of themselves if their own mother doesn’t take proper care of herself? I’m cooking and laundering and cleaning myself because it’s faster and simpler, but we’re missing the joy of us working side-by-side and of them growing toward competence. I stopped working out because there just never seemed to be time, and if there was time, there were certainly more pressing matters than going for a run. Yet, what meaning do they ascribe to my lack of physical activity? How does it encourage them to think about their bodies and the hows and whys of how they take care of themselves? So many things I do out of their sight because it’s more convenient for me. As I mentioned, they don’t see me exercising. They don’t see me reading. They don’t see me doing any spirit work like personal devotions or prayer. They don’t see me writing. They never see me meditating. They hardly see me taking photos aside from quick snapshots. They don’t see me dredging my soul with my journal over a cup of tea. They don’t see me connecting with friends. I only harvest the low-hanging fruit when they’re around, and the low-hanging fruit doesn’t make for a very rich life. 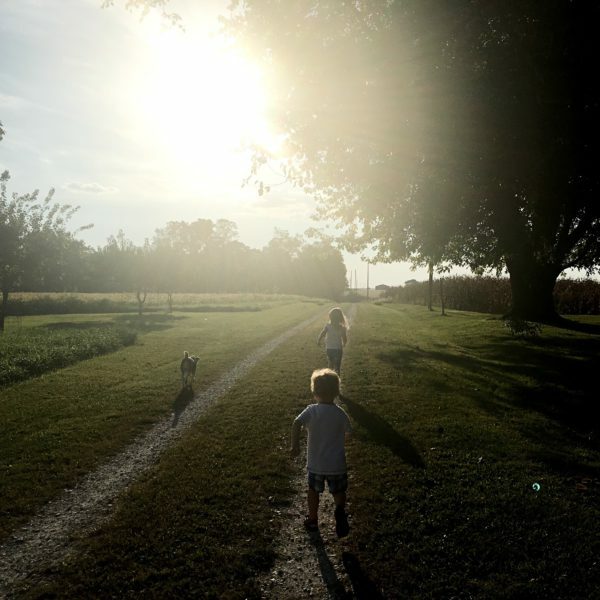 I want my children to live luscious, joy-filled lives of abundance–not so much the abundance of material possessions, but an abundance of the soul, a generosity of spirit. I want their lives to be as bountiful in connection as their introversion or extroversion demands; deeply meaningful, even amidst life’s daily mundane; generous in curious spark and a passion for learning; grounded through intervals of rest and sabbath. But if they don’t see me living this life, how will they ever learn to live it themselves? I’ve set myself in front of my writing nook a few times to journal (as much as I can) while they play (and scream) around me. I’ve set out my book and read a few pages here and there even though the work of home-keeping isn’t yet done. Each little action seems to beget another, and it intuitively feels like I’m moving in a healthier direction. So since I’m a Meyers-Briggs intuitive, I’m trusting that sense to see where it takes me. I’m hoping it leads me to the place where I learn how to incorporate a little more of the joy and freedom I felt when I was the woman in those pictures. Stop Telling Me I’m Doing It Wrong! There’s an article going around on Facebook recently in which a physician and author tells parents we’re doing it wrong–about how we’re abdicating authority and, as a result, empowering our kids to their detriment. It’s not the first article to go around like this and I’m sure it won’t be the last. It’s not even something I necessarily disagree with, but I’m so, so tired of opening Facebook to see things like this show up in my feed once again. You know what I want to say? STOP IT! For the love of God! Please! Stop telling me how wrong I’m getting this whole gig. As a matter of fact, I KNOW. I know I’m getting things wrong. I get them wrong every single day. I forget a zillion things, I snap needlessly at my children, I let my anxiety leak out onto them, I feed them the wrong foods, I haven’t figured out the right balance of giving them responsibility and taking care of them, I haven’t modeled enough community service…At the end of every day, I’m all too certain that I wasn’t perfect, that I screwed up, and that I want to do better tomorrow. Here’s the other thing I want to tell them. You got things wrong, too. Sure, it might not have been the same things I get wrong, but no generation of parents has been perfect. Do you know how much Chef Boyardee and Hamburger Helper my parents and friends’ parents served my friends and me? Or that I reached adulthood quite convinced that peas and corn (with an occasional addition of carrots or green beans) were sufficient in the vegetable department? Or how, as part of the “free range generation,” my parents tell me–chagrined and nervously laughing–how they put me, a kindergartener, alone on a city bus in a major metropolitan city? Or how, as a part of the slightly older “freer range generation,” a former boss told me about how his lack of supervision as a child led to him nearly derailing a train. For real. Can we just cut out this generational judgment crap? What I really need is your wisdom, not your critique. You are smart. You’ve been there, done that, and learned a great deal in the process. I need that voice of experience and reason to navigate my current struggles. I need you to quit playing on fear to establish your superiority. Yes, you were good parents. But parenting is already a competition between peers. Why does it have to turn into a generational competition, too? I also need you to remember that you had a hand in creating some of the very things you don’t like. Helicopter parenting? That’s a direct evolution from a generation of latch-key kids who needed more of their parents than their parents were able to give. I need you to own your own struggles and the effect they had on me (and you) so I feel like we’re in this together, on the same team, not in competition with each other. I need you to remember that just like you did when you became a parent, I’m trying to right some of the wrongs my generation experienced in our childhoods. “In each period, families have solved one set of problems only to face a new array of challenges. What works for a family in one economic and cultural setting doesn’t work for a family in another. What’s helpful at one stage of a family’s life may be destructive at the next stage. If there is one lesson to be drawn from the last millennium of family history, it’s that families always have to play “catch-up” with a changing world.” (source) I’m playing catch-up as best I can in this rapidly changing, information-rich society. Please remember that we–just like you did–are trying really hard. 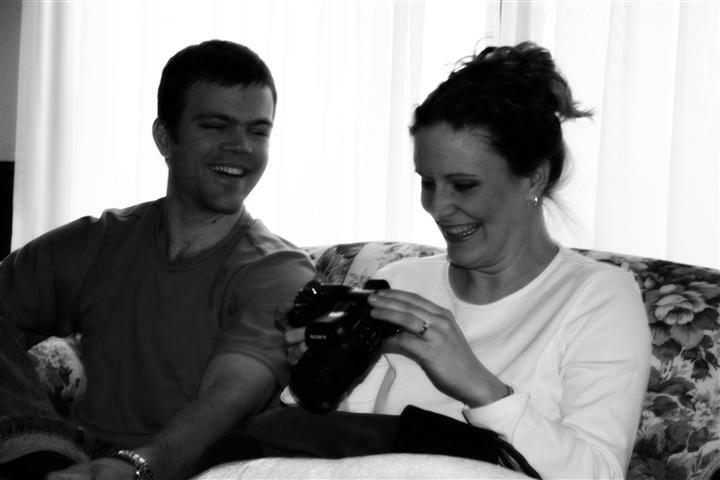 We love our kids just as much as you loved us. We know you made big personal sacrifices to give us the life you gave us, and we appreciate that. Now that we’re parents, we better realize how hard that was, and we love you all the more for it. And we still need you–we need you as grandparents and mentors and friends in our children’s lives, and we need you ourselves. We still need Mom; we still need Dad. We just don’t need anymore judgment. We’re pretty good at that on our own. 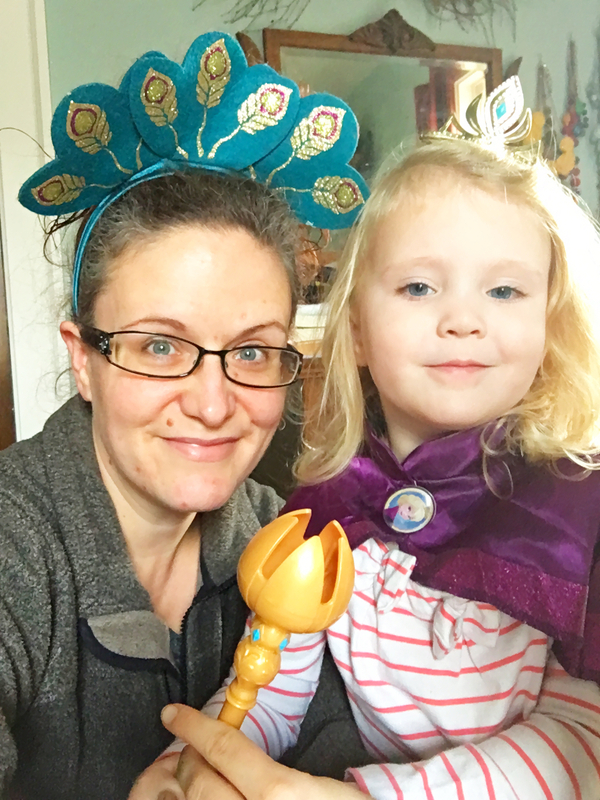 Sometimes the positive aspects of motherhood get swept away in the deluge of busyness, discipline, the day-to-day grind, and the bigger burdens that weigh us down. Focusing on the little wins can be a great way to re-center and come back to what matters most. So that’s what today is – a celebration of motherhood victories, whether they be big or small. I’d love to hear yours in the comments. My win this week is getting a new planner set up and ready to go. It’s not a traditional “weekly planner” kind of setup, although I continue to drool over the Day Designer and Simplified Planner and a few of the other planners out there. 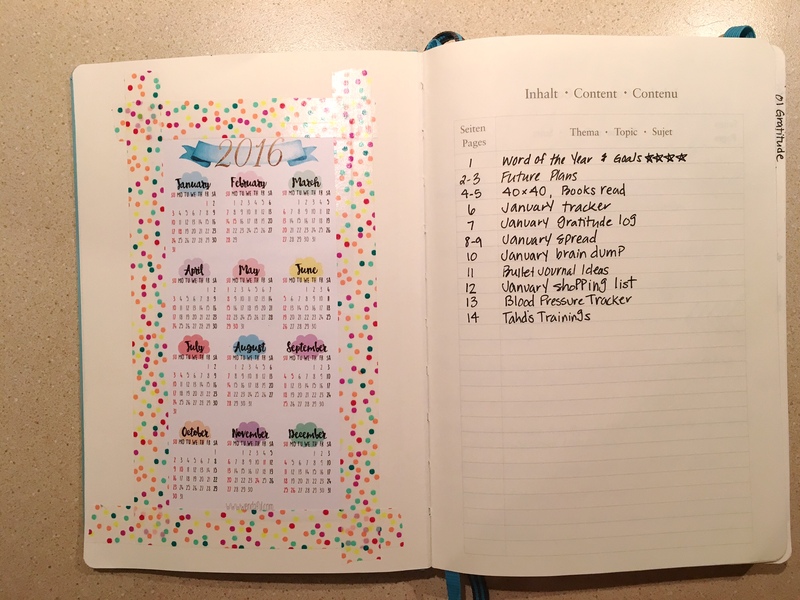 No, the planner I’m using this year is a blank dot-grid book organized in the style of a Bullet Journal. Never heard of it? I hadn’t either, until last year. I can’t even remember where I heard about it! I knew it would be perfect for me; I’d done a less-organized version of it for several years already, and it was exciting to see improvements to a method that’s been working for me already. 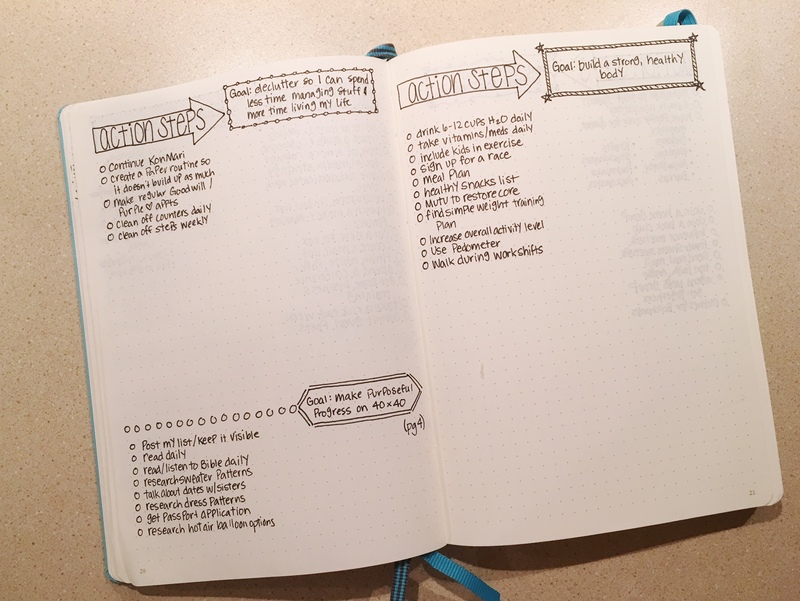 The gist of Bullet Journaling is that you use a blank book and keep track of your entire life in it. You number the pages, and as you add new things to your book, you record them in the table of contents. It sounds kind of hokey and simple, but I love it! 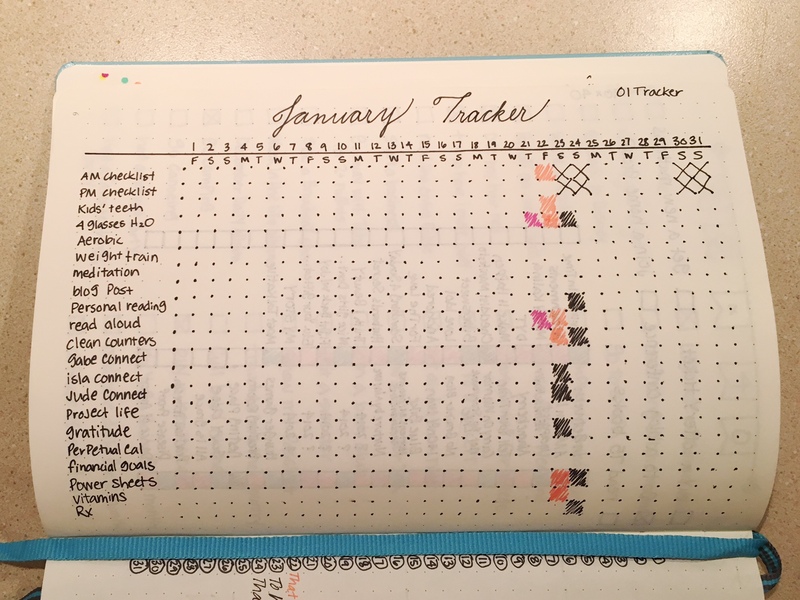 It was a lot of setup, but now that it’s done I can use it weekly to keep track of our schedules and events (I didn’t include a picture of the first weekly schedule, but it’s basically a two-page spread that has a section for each day of the next week or so), to keep track of some habits I’m wanting to build, to keep track of meals and shopping lists and blood pressure readings, and to just clear my brain of all the random to-dos I hold in there (and often forget…). 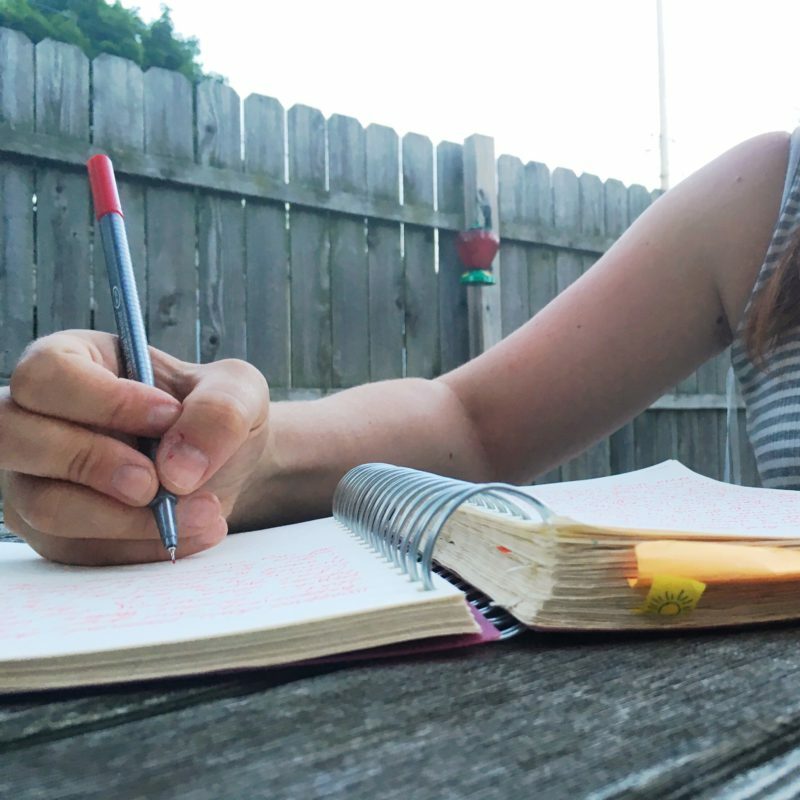 If it intrigues you at all, you can learn more about bullet journaling here, and I was inspired by the design and headings this blogger created. 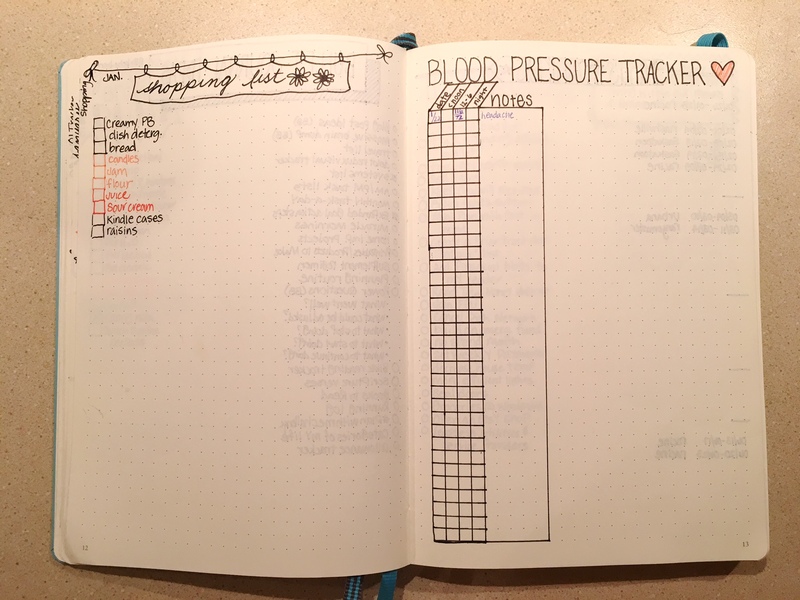 How do you keep track of your day-to-day life? 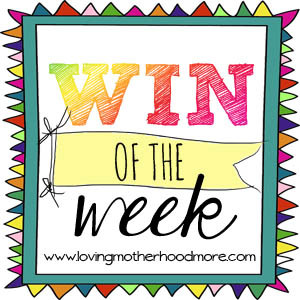 And what was your win this week, big or little? I’d love to hear about your win and cheer you on in the comments! Woosh! We sailed through December at the speed of light, and now I’m finding myself at mid-January and I don’t know how I got here! Our schedules have moved on to life as normal with work and school, but the house still looks decidedly like the holidays are upon us, although my Christmas tree is looking sadder and dryer with each passing day (or at least it still did when I started writing this post…it’s been a few days since then and we got our tree down in the meantime…phew!). I’m also kicking off the new year with a cold, which could work out well as far as my tree is concerned–a few well-placed sneezes and I could probably startle the needles off their branches! 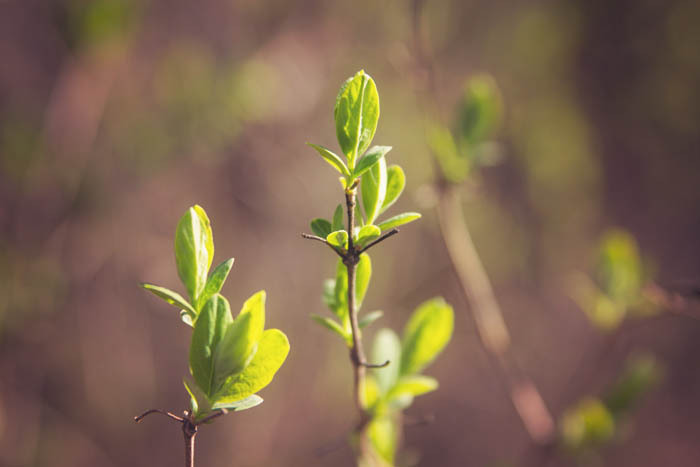 Facebook and blogs have been awash in resolutions and goal-setting, and around the middle of this week I started feeling panicky. I love goal setting and projects and dreaming and planning for the future, but it seems like that train has left the station and I didn’t have time to get on it! I haven’t settled on any resolution, I haven’t written down any goals, and we didn’t even fill out our yearly stocking recap (more on that later, hopefully…)! Argh! Can we say left behind? I had to take a deep breath, though, and remind myself of what I’ve learned over the past few years: it’s okay to do what works for you, even if that’s not the same as what works for everyone else. Just because your path looks different doesn’t mean it’s going to take you to any less spectacular places. This tired, overwhelmed mother is beginning to learn her limits and embrace herself. SMART goals may be all the rage, but I’ve learned my temperament and current life circumstances don’t lend themselves well to strict expectations. When I set expectations but don’t live up to all the specifics, discouragement sets in and I stop making progress. I used to be a huge perfectionist, and if I set my mind to something, I accomplished it, no matter the cost. Know what that got me? Sickness. I got tired, I got rundown, I got excessively anxious, and I got sick for more than a year. Faced with the prospect of ongoing illness and worsening exhaustion, I made the only choice I could–I started to let go of perfect. I overhauled my life in both major and minor ways. I said no more often. I started learning how to embrace the journey, not just keep my eye on the prize of the destination. I began learning how to give more grace, both to myself and others. What works for me? Intentions. Intentions are purposeful destinations on which to fix my attention, but they still allow me the flexibility to have pyjama days or to change their emphasis throughout the year as my circumstances require. They also help me to shift my focus from the need for perfect results to appreciation of the process.Last year, I set a few intentions – delight more, drink more water, be more present. I’d say I made progress in all those things–maybe not as much as I’d have liked, but I also dealt with a very busy travel schedule on the part of my husband, ongoing sleep problems with my littlest, an extended family trip, and some unexpected parenting challenges with some behavioral and emotional issues. I’ll give you an example. Every year, I make some sort of plan to be healthier/eat better/lose weight, etc. In the past, I’d set specific goals about the number of pounds I’d lose, the amount of sugar I’d cut back on, the frequency with which I’d exercise, and every year, when I fell off track, my lack of progress would snowball into defeat and I’d quit. This year, I didn’t set any specific goals other than set the general intention of taking care of my body. 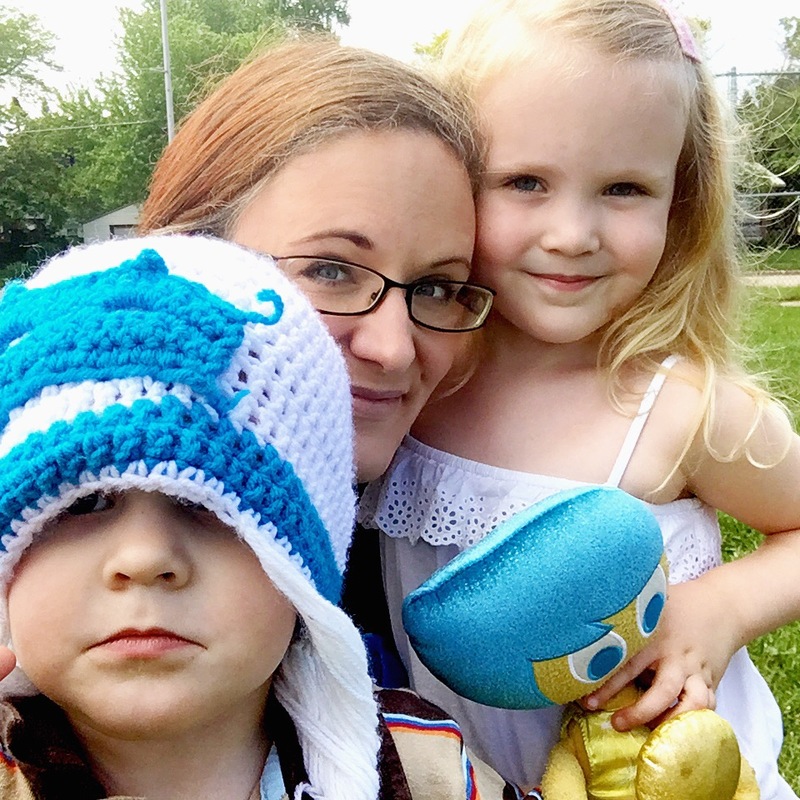 While I’d hoped that would lead me to weight loss and glowing health, it wound up leading me to a place where I could release some of the paralyzing body anxiety I’ve been carrying since I started having babies. Do I love my body yet? No. But I’m not controlled by feelings of having a “fat day” or self-hatred when I indulge too often in sweets. If my focus had been on specific, quantifiable physical results, I don’t think I’d have been able to broker this sense of body peace. I wound up at a different destination than I’d originally anticipated, but it was a good one nonetheless–maybe even a better one than the one I would have selected for myself. What I like about intentions is they set me free–free to pursue, free from the fear of failure, free to adapt to where my year naturally takes me. I need that freedom that this point in my life. Most days, I feel like I have so little control over anything. The days on which I have the most to accomplish are inevitably the days during which a child gets sick. Or the mornings in which I just need a few extra minutes of shuteye wind up being the mornings a child wakes up before dawn. I need the freedom to be okay with where life is taking me and still have some degree of intentionality about it. This year, I selected a word as my intention. That word is “system.” I’ve realized that it’s much easier to do things that are part of a routine than if you have to think about them and plan for them everyday. Take brushing my teeth. I never forget. It’s just part of the process, and I don’t expend any energy thinking about it–it just gets done. So many other things in my life, though, are haphazard, which means I expend precious mental energy on planning their execution. I’d like to take on a few of these haphazard tasks this year and put them into some sort of system that works more seamlessly for me. Possible areas to systematize are drinking water, weekly power hour (organization and calendar time), laundry (don’t get your hopes up, Tahd…), exercise, Bible reading, cleaning off my counters, making our beds, date night schedule, menu routine, blogging schedule…I could go on, but you get the idea. 😉 We’ll see how much progress I make! 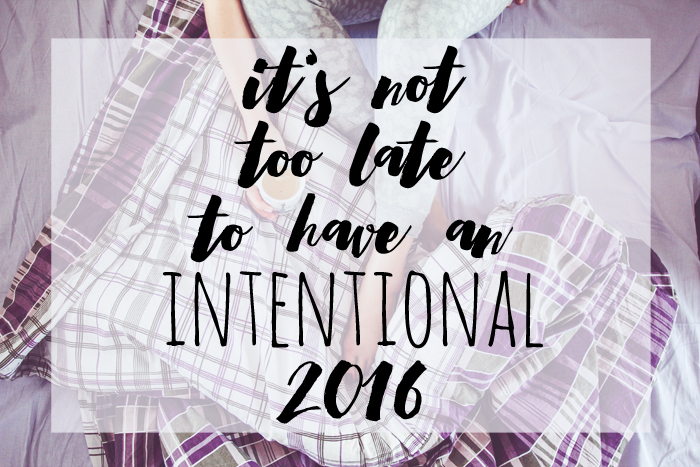 It’s not too late to have an intentional 2016. We don’t have to start perfectly or establish lofty goals, or even establish specific goals at all. That’s what I keep reminding myself as I flesh out my hopes and dreams for the coming year–nobody was checking my resolution list to make sure it was ready to go by January 1. I’m not behind and there’s no need to catch up…only a need to start now, exactly where I am, and make progress, whatever form that happens to take this year. How about you? Any goals or resolutions made? Any intentions set? How are you doing on them?